The Uni-Loc Weight Cartridge Kit lets you fine-tune the weight of your cue within a tenth of an ounce. Eight different weights, ranging from 0.1 oz, to 2 oz., give you up to 30 possible weight combinations for unmatched precision. The versatile installation tool has dual prongs that interlock with each weight and a detachable handle. 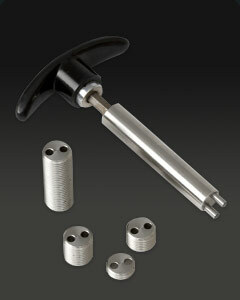 The tool can be used with the handle for easy on-the-go tuning, or with a drill bit for lightning fast tuning at home.